A former Russian lawyer named Yuri Alexeev got sick of his busy, high-stress life in the city. So one day, he quit and dug himself a “rabbit hole” 60 miles outside of Moscow. “I was born, lived, studied, lived some more, and worked, and then I got fed up with everything,” Yuri says. His solar-powered sanctuary is quite a bit cozier than an ordinary rabbit hole, with a wood stove, walls reinforced with wood, straw and clay and water-proof sheets to keep it dry, and a library, which he calls the most important part of the house. He also has a computer with internet to keep in touch with the outside world and to allow him to participate in the Worldwide BookCrossing Library – a book-sharing system that encourages members to liberate their books “into the wild” for a stranger to find, and to track where they go. 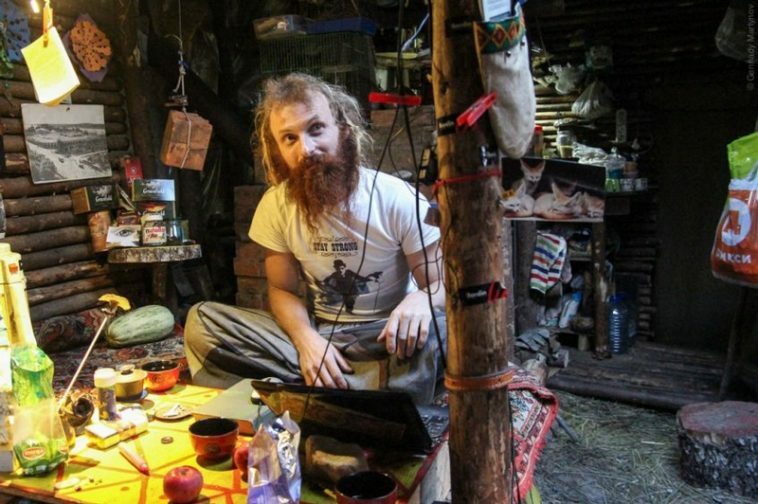 Thanks for posting this story about Yuri Alexeev, other wise may have never found out about this “human living on planet earth”….love that expression. Always enjoy reading Return To Now. He has liberated himself from the dregs of life. I think it’s wonderful! I wish I could do likewise. My Wife and I had intended to retire in Montana. In a little better cabin. Not fancy.